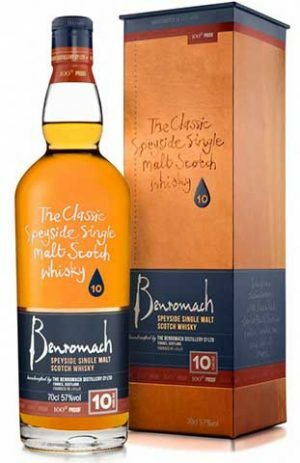 Benromach 10 Years Old is a multi-award 700 ml, 43% abv, Scotland (Speyside)winning Single Malt Scotch Whisky hand-crafted at Speyside's smallest working distillery. Initially matured in a mix of Bourbon and Sherry casks, the whisky is transferred to European oak Oloroso Sherry casks for a final period of maturation. The result is a beautifully balanced dram, displaying a rich Sherry character, summer fruit flavours, malt creaminess and a light peat smoke influence. 80% Bourbon barrels, 20% Sherry hogsheads, final year in first fill Oloroso casks. A heavily peated single malt, made using the same intensity of peating as Laphroaig. 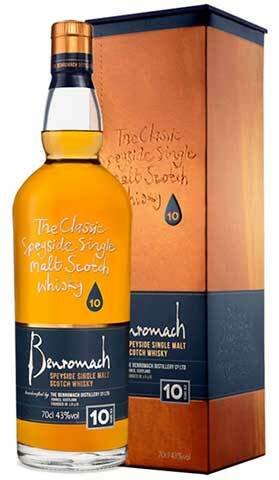 A batch of heavily-peated spirit is made each year at Benromach, and this particular expression was distilled in 2008. It has been matured in first fill ex-Bourbon casks. 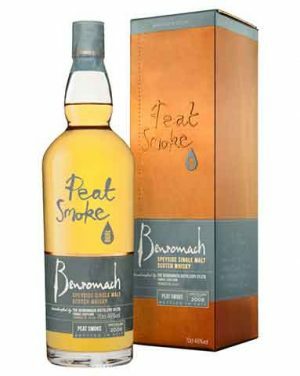 This Benromach Peat Smoke expression uses barley malted to 67 parts per million. 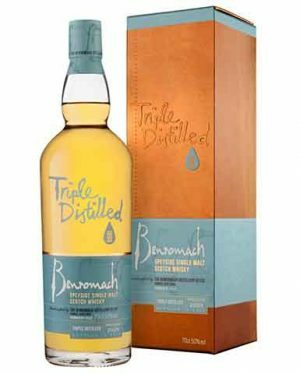 Another new addition to the Benromach stable of classic Speyside single malt whiskies is now available, introducing the Triple Distilled. 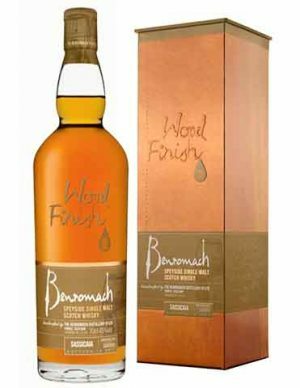 This Benromach Wood Finish is matured in first-fill ex-Bourbon barrels, followed by 18 months in Sassicaia casks from the wine-producing region of Bolgheri in Tuscany, Italy. Distilled in 2006, Bottled in 2015. 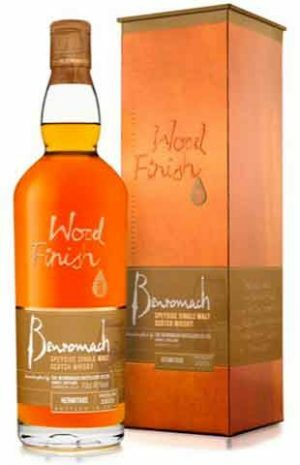 "brimming with luscious fruitiness and a subtle smoky edge"
Benromach 10 Year Old ‘100° proof’, bottled at the old Imperial measure which equals 57% abv. Matured in 80% bourbon, 20% sherry casks. (This is called 100 Proof because once, all whisky in Scotland was measured the imperial way, this tradition actually started with rum when sailors wanted to make sure their rations had not been watered down, so they mixed a little spirit with gunpowder.... if it ignited, it's strength was 'proved') "The balance of sweetness, fruitiness and gentle smoke is superb"
A notable new addition to the Benromach stable of classic Speyside single malt whiskies is now available, introducing the 15 Years Old. 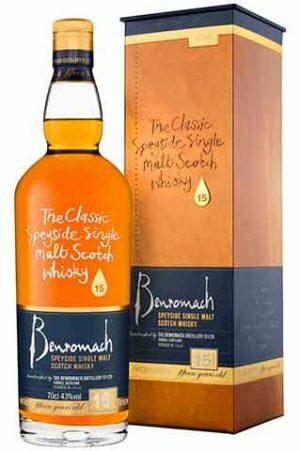 Benromach 15 has a distinctive golden amber colour thanks to long maturation in sherry and bourbon casks and a soft smokiness It tastes of luscious sherry and rich fruitcake with stewed plums and a hint of cocoa. 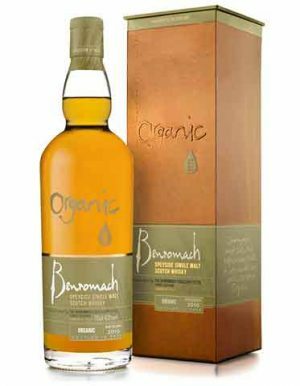 This Benromach whisky is certified Organic from start to finish, meeting rigorous UK Soil Association standards for growing the ingredients, distillation, maturation and bottling. Unique on launch in 2006, this organic certification is still very rare today. Matured in organic American Oak casks. The Hermitage Wood Finish was matured in first fill bourbon casks before being finished for 27 months in hand-selected Hermitage wine casks from the northern Rhône region of France. "notes of intense and juicy summer fruits, pure vanilla, melting chocolate and a gorgeous underlying subtle touch of smokiness"